The following images are the reproduced engravings of J.W. 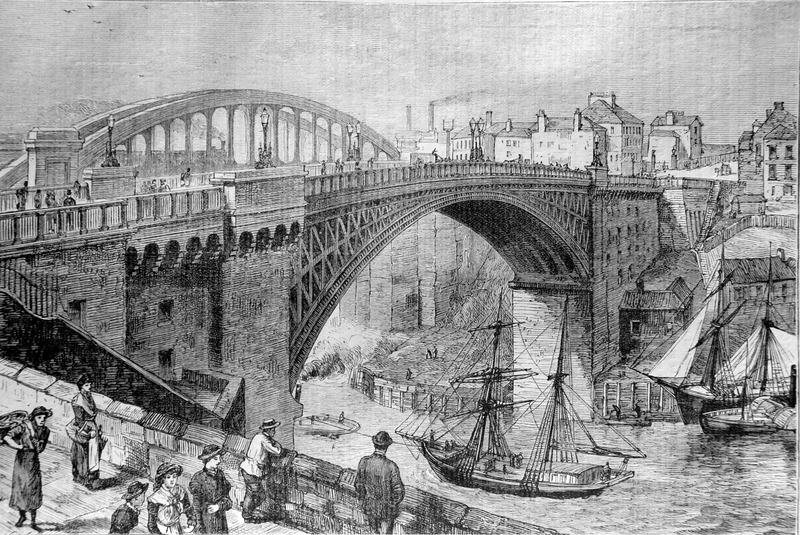 Carmichael (1800 – 1868) which depict views of places along the River Tyne from Bardon Mill to Tynemouth. They were re-published in the 1969 book “Pictures of Tyneside” (which I found in a second hand book shop for a fiver!). The original copper plates from the first edition in 1830 were found in 1966 from which these prints were taken. They beautifully depict everyday life at various location along the Tyne. With the advent of photography this wonderful art form went into decline. On the site now occupied by the Royal Insurance Buildings stood, till the autumn of 1843, one of those quaint overhanging structures in which Newcastle was formerly so rich and of which even now, despite the energy of Town Improvement Committees and the desire for more showy premises and larger rents on the part of property owners, the city possesses some excellent specimens. The building to which I refer was known for more than 120 years as Katy’s Coffee House. Not that Katy herself lived so long, for she died in 1767, at the age of three score years and ten; but there was about her and her management of the house half tavern, half club an individuality and character which fastened her name even on the very building itself. That building was long since destroyed; but the name remains, for who; Novocastrian has not heard of Katy’s Coffee House? In the stirring times of the great national struggle between the people of England and their king, in the seventeenth century, this house was the residence of Alderman Thomas Bonner, a merchant who was thrice Mayor of Newcastle, and a zealous Puritan. He was chosen Mayor for the first time on the 2nd October, 1648. The Common Council Books record that on this day “Thomas Bonner, Esq., Mayor elected, coming from the Spittle to go to his dwelling-house upon the Sandhill, the Serjeants carrying torches lighted in their hands, one Edmund Marshall [doubtless an over-zealous Royalist, a genuine Church and King man] threw a long stick at the said lighted torches, and struck divers of them out; and, it being dark, stones, &c., were flung.” The new Mayor had clearly stayed late at the Spittle. But his was then the ascendant party, though its ascendency was a thing of recent date, and there had doubtless been rejoicing amongst the aldermen quiet, sober rejoicing, though, as befitted Puritans. A contemporary writer says that the army, coming hither, “was entertained with great guns, and ringing of bells and feasting.” “The 19th,” says the general just quoted, “we were very sumptuously feasted by the new Mayor of Newcastle,” in his old house on the Sandhill of course. During the repast, tradition tells us, “the town’s waits or musicians” cheered the company with their harmonic strains. The Lort Burn, then an open stream, flowed down the lower part of the Side, past the Mayor’s door, and across the Sandhill into the Tyne. Opposite Bonner’s house it was spanned by a narrow bridge, whereon the musicians stood whilst displaying their skill. Bonner had been dead more than half a century before Katy’s arrival on the Sandhill. She came in the early days of George I. Not more than twenty summers had passed over her head when she assumed the management of what became by her prudent care a prosperous and respectable Coffee House. Hers was a house frequented by the ancient dignitaries of Newcastle, who went in and out at her front door, boldly and unashamed. Here lawyers met their clients, and hero valuable properties were sold by auction but “by inch of candle.” Katy, whose real name, by the way, was Kate Jefferson, maintained the fame of her house a full half century, and died, a spinster, on the 10th day of January, 1767. A spinster she could only have been by her own fixed and resolute determination. What stories Katy could have told, and doubtless did tell, to her customers stories not only of the overtures of seekers after a single landlady of a successful house, but stories of the many odd and ordinary, good-humoured and ill-humoured characters who had frequented her house during her fifty years of mistress-ship! What would we not give for Katy’s autobiography!